In cabinetmaking, cherry is rated one of the favorites because of its beauty and versatility it has warmth, personality and charm. As a craftwood it cuts,stains and sands beautifully, which makes it a hobby wood of choice. 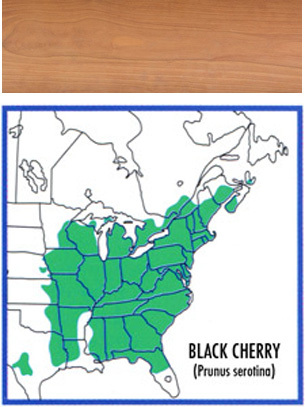 American black cherry is widely used for paneling and as a veneer, burial caskets and other specialty items such as gunstocks, tobacco pipes, musical instruments, turnery, carvings, etc. It is only moderately durable for outdoor projects. 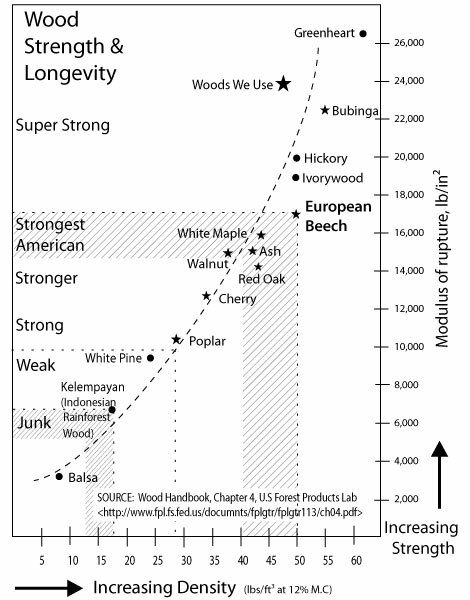 Cherry wood is a favorite of all the domestic wood species. Cherry has a pale yellowish sapwood and a darker heartwood. The wood's colour deepens to its characteristic reddish brown, almost mahogany-like colour when exposed to the sun. The sapwood never darkens to the same colour of the heartwood. Cherry often shows a waving curly figure when finished. Heartwood can have dark spots or fine black lines that are actually gum pockets, that pose added challenges in finishing. The grain pattern welcomes a full range of medium to dark finishes and bleaching treatments. The best way to achieve a uniform deep red colour is to let mother nature do her work rather than attempt staining. If you have to replace a board, remember in time, the sunlight will darken all cherry, even if it doesn't look like it matches in the beginning. Bubinga wood can be an amazingly wavy-figured exotic wood, sought by guitar makers and small box builders alike... often referred to as an African rosewood, although technically NOT from the rosewood family. 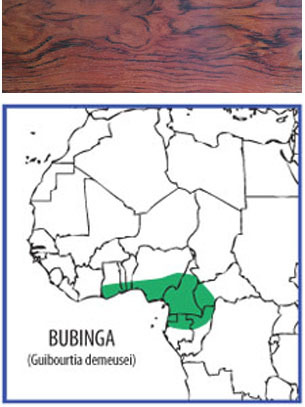 The bubinga tree can grow to heights of up to 100' and 3' in diameter and grows mostly in parts of West Africa, Cameroon and surrounding nations. With trees this large they can produce quite wide and long lumber. Can have mult-shaded, interlocking or wavy-figured bands of colour in various shades of red with distinct purple overtones, in the more exotic samples, and fine, linear grain with greater colour consistency in the balance. Colour does darken with age. It is often referred to as an African rosewood, although technically NOT from the rosewood family. If you are lucky enough to get bubinga lumber with no visible sap pockets then you'll find it an easy wood to get a great finish with a rich luster. The sap pocket when present can cause some localized glue up or finishing issues. For more photo examples of Bubinga click here. Early settlers called the tulip tree "canoe wood" and harvested it for ships, paper mills and construction. Poplar is found in many furniture projects, toys and wood turnings because it is inexpensive, fairly workable and takes nails, screws and glue well. Poplar is also used quite often for more industrial purposes, such as the core of finer plywoods or for crates and pallets. 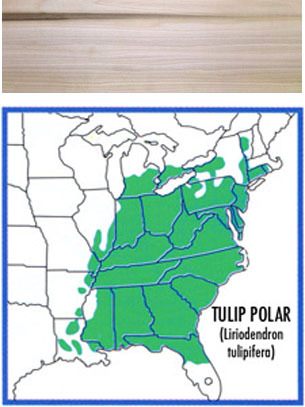 According to the University of Kentucky, the tulip poplar is the tallest North American hardwood tree. It is named for the distinctive green and orange tulip-shaped flowers that grow upright, high in the tree, in May and June. The flowers produce samaras, cone-shaped spirals of seeds, in fall, and the seeds themselves are extremely sharp. The four-lobed leaves grow 6 inches wide and turn yellow or brown in fall. Duck-bill shaped buds appear in winter. Yellow Poplar is a domestic hardwood. Poplar is straight grained and uniform in texture. The sapwood is white and often several inches thick. The heartwood is a yellowish brown to olive green sometimes streaked with dark green, purple, black, blue or red. Poplar is renowned for it's ability to take paint well. It is commonly the wood stock of choice when building woodworking projects that will be painted. It is relatively resistant to decay, and when sanded, primed and painted thoroughly, should hold up well to normal wear and tear for many interior projects. "We are about to purchase our fourth mattress from you and we love your store, your staff, and more importantly, your product. Thank you! Customer since 1993."